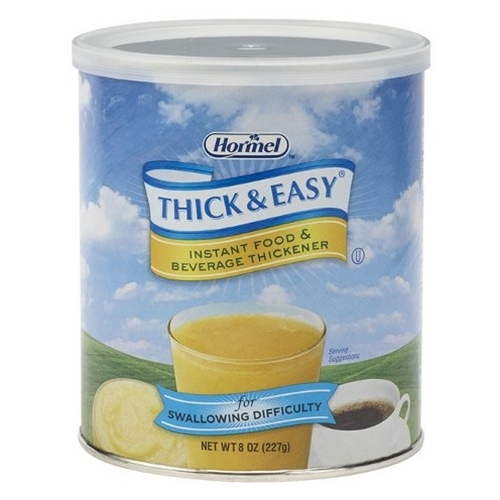 Hormel Thick & Easy Instant Food & Beverage Thickener from HealthyKin.com makes swallowing easier, more appealing and safer - three easy reasons why Hormel Health Labs' Thick & Easy food thickener is the product of choice used by thousands of healthcare facilities for their swallowing impaired patients. Our thickener is so versatile that it is now possible to thicken all types of hot & cold foods, liquids and supplement drinks without affecting the taste. Simply add our specially formulated thickener to your desired food or liquid, and almost instantly, they become the proper consistency for safe swallowing. Patients with dysphagia can enjoy tasty, nourishing foods, while maintaining a properly hydrated and healthy nutritional status. I wrote the long review on 5/31/2013. We're now at honey consistency. We found that with this thickness, all the beverage won't fit back into the original bottle so we put the remaining contents in another cup or in a larger container. When the container is almost empty, we have to turn it upside down in a cup to get it all out so it's not wasted. Still a great product for those who need it and there is no alteration to the taste of the beverage. Absolutely the best thickening product!! We will not be purchasing anything else. Best quality product at a reasonable price. 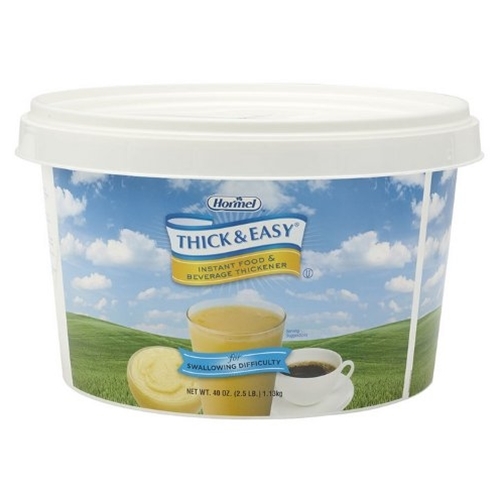 Definitely the best of the thickening products we have used. Your pricing is also very good. Excellent product and good price. This is great stuff. We've been using this for about 3 years for Mom. The hospital used it and it's a tad more expensive than other brands but this mixes very well and is worth it. We tried the others and this is the one to get. We started with just some thickening to "nectar" and are now approaching the "honey" consistency. We buy zero calorie fruit flavored water, various fruit juices with low sugar but high in antioxidants, and nectar juices (found in the Latin section of store or bodega - these are nice and sweet even if low sugar). Tips for mixing: 1. Do at room temperature and do quickly! Use a measuring cup or other small cup with a pour spout. Mix one heaping teaspoon at a time. 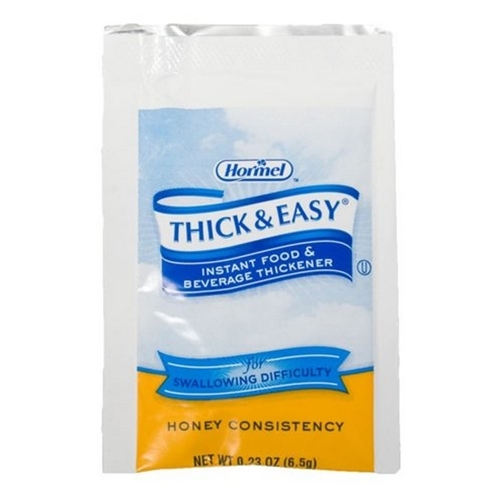 Put thickner in cup, add small amount of liquid, stir quickly and pour back into bottle. Repeat as many times as needed to get desired consistency. Until you know how many tsp. are needed for your amount of liquid to thin, you might have to put the lid on and shake it. You can continue to mix more thickner using what you already thickened. Do not dally at any point in the mixing process as it thickens quickly. Doing in small amounts eliminates any clumping. Tip #2: if you have to administer any liquid meds, mix a special batch extra thick to use. Adding additional liquid thins it out so if you start with extra thick, the liquid meds will thin it out to the right consistency. For liquid meds, I start with just a half cup of thickened juice so it can be consumed more quickly. Mom drinks out of a 6 oz child "sipper" cup - without the sipper lid. It fits her mouth, it's easy to handle and manage quantity. Tip #3: It can be zapped in the micro for a few seconds if there is any sensitivity to cold. Tip #5: It's a learning process you have to customize for each individual so be prepared to make adjustments even if the beverage is cold. If too thin, you can add (but do in small quantity) If too thick, they can probably drink it thicker - no harm. Good luck.